John Kenneth Muir's Reflections on Cult Movies and Classic TV: From the Archive: Buffy the Vampire Slayer: "Pangs"
From the Archive: Buffy the Vampire Slayer: "Pangs"
But in broad terms, relatively few cult TV programs boast Turkey Day editions in their episode rosters. The episode -- penned by Whedon and Jane Espenson, and directed by Michael Lange -- first aired on November 23, 1999. In this particular installment Buffy (Sarah Michelle Gellar) and the Scooby Gang investigate a murderous demon after the buried Sunnydale Mission -- believed destroyed in the earthquake of 1812 -- is accidentally unearthed. 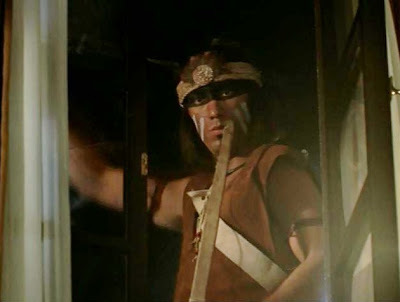 Unfortunately, by breaking into the sealed subterranean chamber, Xander accidentally releases the vengeful spirit of a Chumash warrior named Hus (Tod Thawley). Hus's Native American people suffered imprisonment, forced labor and terrible disease when the white man arrived from Europe and quickly populated the American continent. Now, the demon’s first order of business is “re-creating the wrongs” done to his native people all those years and centuries ago. As Buffy tracks down the vengeful and murderous Hus, she also broaches another challenging undertaking. She prepares a traditional, home-cooked Thanksgiving meal at Giles’ apartment. In particular, Buffy recalls the happy holidays from her youth and -- during her first year away at college -- desires to recreate that experience. Buffy talks meaningfully and wistfully in the narrative about the “sense-memory” of Thanksgiving that occurs every time she smells a roasted turkey. The socially-minded Willow (Alyson Hannigan) is upset, however, because she believes Thanksgiving is really just a celebration of “one culture wiping out another.” It’s a “sham,” Willow complains, upset. Giles (Anthony Head) and the recently neutered Spike (with a behavior-modification chip in his noggin) are bothered by Willow’s unflattering description of the autumnal holiday. They both see the situation more plainly. “You had better weapons…and you massacred them,” Spike (James Marsters) tells Willow of the Native-American population. Simple as that. Or is it? The debate raises an important question. Is it right for Buffy to “slay” Hus when he has a legitimate grievance against our ancestors? What’s worse, isn’t he right to be upset that -- on his people’s former land – the conquering people are now building a “cultural center,” in effect a celebration of the genocide of the indigenous folks? What remains so terrific and funny about “Pangs” a full decade later is that Buffy’s attempt to host a happy holiday dinner is undercut at every turn by these grave philosophical disagreements in her family, a unit which certainly does include the demonic Spike at this point. The topic turns overtly political after a fashion, and everyone who has ever returned home for a family holiday knows that politics is the source of much indigestion at real-life gatherings, at real-life holiday feasts. In-laws who hold different viewpoints are suddenly thrust together for a meal at the same table -- and there’s usually alcohol involved too -- and boy, the sparks can really fly. The philosophical discussion underlining “Pangs” concerns a question not unfamiliar to most of us in modern American culture. Can a wrong in the past be repaired by a wrong in the present? This idea has been discussed much, especially near the end of Clinton’s second term, specifically in relation to America’s ignoble history of slavery. Are modern Americans -- folks living right now -- to blame for their ancestors' misdeeds several generation ago? In terms of the Native American genocide, the same question is raised. And if reparations forced upon a blameless current generation aren’t particular just either, does a simple apology to the families of the wronged feel like enough? Is that the best we can muster? 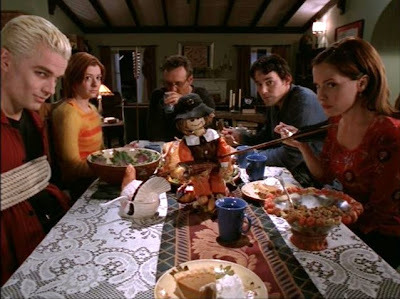 Obviously, there are no simple answers to such deep questions of American history, but I love how Buffy the Vampire Slayer takes the context of Thanksgiving and holiday gatherings and then makes the dramatis personae debate the conflicted nature of the holiday, each according to his or her own personal beliefs. Nobody is bad. Nobody is evil (well, nobody besides Spike…). Everyone just boasts a different perspective on what remains a controversial subject. Here -- treading deeper into the quagmire -- some hurtful comments are even made about a “minority” living in Buffy’s modern, diverse Sunnydale: demons. Xander lays down the law, and it sounds perilously like bigotry. “You don’t talk to vengeance demons, you kill them!” he stresses, angry and sick. Well, of course, this remarks hurts Anya’s (Emma Caulfield's) feelings. She’s a demon after all. they? Not all of them are evil, are they? What about Oz? What about Angel? And on and on. Is killing them on sight the answer? Finally, Hus and a “raiding party” of demons arrive at Buffy’s Thanksgiving meal, and there’s a colossal battle between the Slayer and a demon she has zero interest in killing. Buffy would prefer to offer an apology, rather than fisticuffs. To the direct-minded Spike, however, this approach is folly. “You exterminated his people,” he reminds Buffy of Hus. An apology ain't gonna cut it. Finally, Buffy does fight with lethal force, and the implication seems to be that some hurts, some breaches, just can’t be resolved peaceably. 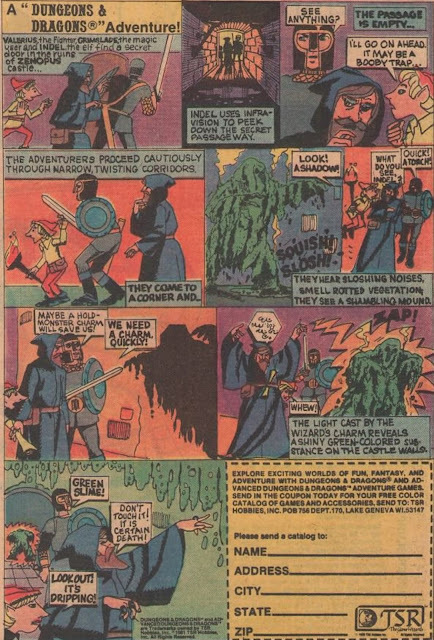 Ultimately, even the politically-correct Willow feels like something of a hypocrite. When the Native-American demon spirits attack, she’s among those who pick up shovel and fight for their lives. As we all would under the same circumstances. But the coda in "Pangs" involves a hope for the future instead of a conflict over the past. 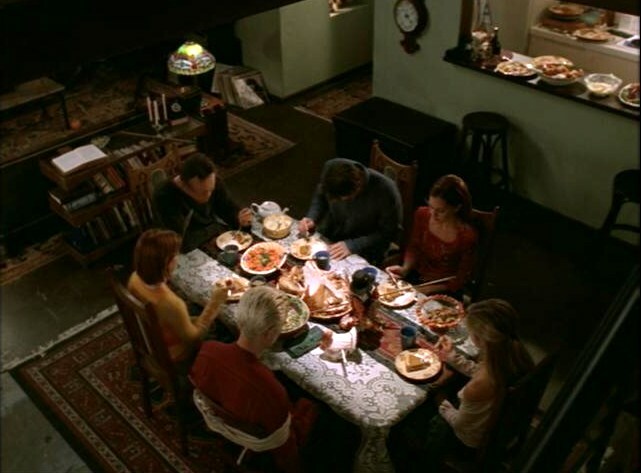 In the episode's last scene, the threat of Hus is nullified and Buffy and her friends (including Spike) sit down together -- demon and human -- for an enjoyable "family" feast. In some way, this final image of an ad-hoc, modern American family consisting of a demon, two vampires, two Brits, a Valley girl, a witch (and lesbian) and a construction worker seems to get at the point of the narrative's debate. Just the fact that these diverse folk break bread at the same table may provide the key to healing old, historical wounds. Perhaps enemies old and new must share a Thanksgiving table, a special meal together, and start fresh. Build new, better memories. Let go of the angers of the past, even if they are justified. Otherwise, as Hus learns, the only possible future is death. At least breaking bread, and passing the cranberry sauce, is a start. "I didn't give him syphilis!" Great episode (I get that the Big Bad is a step down from the Mayor, but this is an excellent season of a fracturing, and ultimately rehabbed, dynamic) and eminently quotable.